The most valuable number plate in Victoria is ‘1’. The plate is currently owned by Peter Bartels, who was previously the CEO of Coles as well as Fosters. Newspaper reports state that Bartels has knocked back a written offer of $1.5 million for the plate, whilst figures of $2 million and $2.4 million have been mentioned elsewhere on the internet. Legend has it that when the plate was originally produced in 1932 there was disagreement between the Police Commissioner, the Premier and the Governor about who should have the plate. To solve the problem the plates were not issued to any of them, and were instead locked in a vault at the Motor Registration Board. There they stayed until the plates went to auction in 1984. Vic 1 was purchased at the October 1984 auction for the sum of $165,000, reportedly by a retired mechanic from Ballarat known as Mr Gary Price. They were later purchased by Izzy Herzog for an undisclosed sum. Herzog was the owner of City Saab at the time. At some point they were purchased by John Avram for an amount said to be $250,000, and according to reports the plates had or have “been through several private hands”. A 1988 news article (full text at the end of this page) stated that the plates were on the market and expected to fetch around $250,000. It is not said who was the owner at this time. 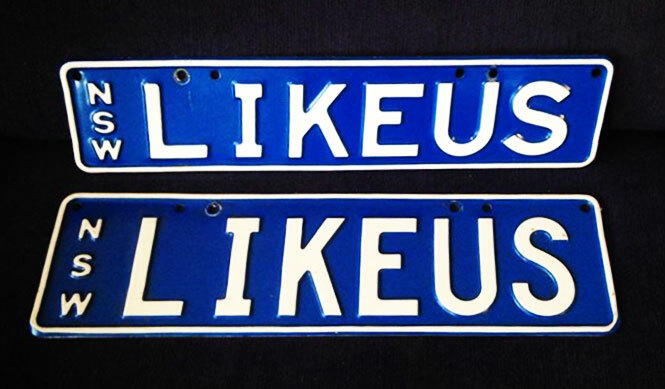 In 1991 the plates were acquired by Carlton & United Breweries (CUB) for an unknown amount, which is rumoured to be $100,000. It is widely reported that the current owner, Peter Bartels, negotiated ownership of the plates as part of his severance package when he left the company in 1992. Bartels was CEO of Fosters / CUB. Numerous media reports have confirmed Bartels as the current owner. The plate did not make it’s way on to any vehicle prior to the 1984 auction. Information from this time onwards is not complete, but we’re doing our best to put the puzzle together. In the mid to late 1980s the plate was registered to its first vehicle, which was a Saab 9000 Turbo. This information was provided directly to NumberPlates.com.au by Francois Roth, who was in charge of of PR and marketing at City SAAB at the time. City Saab was owned by Izzy Herzog. Roth registered the vehicle with the Vic 1 plate, and used it as his company car for a month before use of the car and plate was offered as an auction prize in a Channel Ten telethon. The prize included use of the vehicle and the plate for one month, and was won by real estate agency Debenham Tewson Griffiths who paid $6,000 for the privilege. The photo to the right shows the Saab wearing the Vic 1 plate, and pictured are Roth and a representative from the real estate agency. The plates photographed are the auction style plates which would have been produced in the mid-80s. Comments on the Heritage Number Plate Spotting page indicate that the Vic 1 plate made it’s way onto a Ferrari and Rolls Royce at some point between the SAAB and the HSV. An article from an unknown source (posted by Craig J. on the Heritage Plate page) contains further information regarding the plate being fitted to a Rolls Royce owned by Avram. After CUB acquired the plates they registered them to a HSV SV5000 specially produced for one of CUB’s brands, VB. We don’t have any photos of the plates on the vehicle at the time, however the current owner of the vehicle has displayed the car with the Vic 1 plate attached. 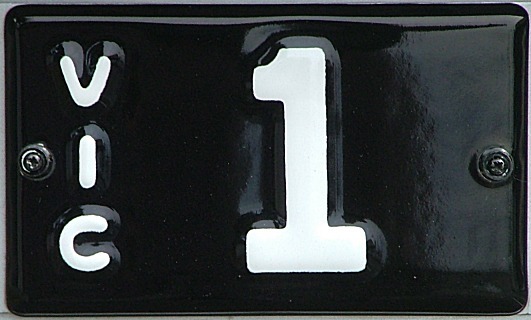 The plate used for the display is a traditional heritage style plate, but presumably an auction style plate would have been used on the vehicle given that this style was used on the cars immediately before and after the HSV. Some photos exist of a white Porsche 911 Turbo wearing the plates. As with the earlier SAAB, the plates used are the auction style rather than the traditional heritage style. A photograph of the registration label of the Porsche was also taken, which shows an expiry date of 17 December 1993. Presumably the photo was taken sometime within 12 months prior to this date. In 2000 the plate was photographed on another Porsche, this time a 996 Carrera. Although this photo is a little grainy (it’s from a newspaper cutting) it appears that the plate used this time is the traditional heritage style. There certainly appears to be a serif on the base of the 1. 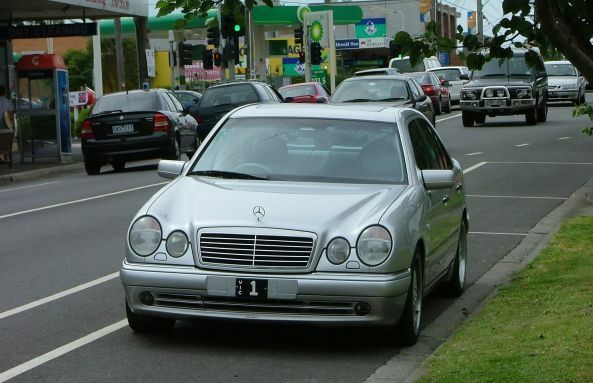 Plenty of photos exist of the Vic 1 plate attached to a Mercedes E55 AMG. This time it is very clear from the photos that the traditional heritage style plate is being used. Presumably this was a newly issued plate rather that the original enamel plate from 1932 which spent decades locked in a vault. The earliest photo of Vic 1 on this car is from 3 October 2004 and was posted on Plate Shed. For the last few years the plate has called a Mercedes E63 AMG home. This seemed a logical upgrade from the earlier model E55. During this time “plate spotting” has become more popular, and therefore dozens of photos of the plate on this car exist. The first sighting on this car would appear to be in November 2009. Vic 1 would have to be one of the most photographed number plates in Australia, so it’s no surprise that we have been sent quite a few photos of it. We do have additional photos of Vic 1 which are not included in this page, but you can only publish so many photos of the same plate on the same car! Based on the registration label below, the photo of Vic 1 on the Porsche was taken in 1993. Although this photo was taken in 2016, it shows the actual car that wore the plates up to 1992. Below are some additional photos of the vehicle and display board. Source: Heritage Number Plate Spotting. This image is was posted on Plate Shed and shows a magazine clipping from February 1985. It is said that the gentleman pictured was the purchaser of the plate at the October 1984 auction. “Former Fosters’ Group and Coles Myer chief executive Peter Bartels owns the coveted VIC 1 plate and rejected a written offer of $1.5 million last year. 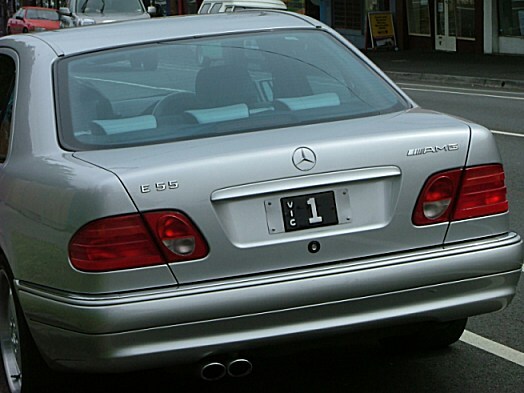 The plate is mounted on a silver Mercedes E55 worth about $60,000. The exclusive plate was first sold at auction in 1984 for $165,000. It has been through several private hands, including millionaire car wholesaler Izzy Herzog and the disgraced former head of the Interwest hotel group, John Avram. “To some, it may seem strange that two apparently worthless slabs of baked enamel can be found lurking among the vital documents in a safe deep at the Road Traffic Authority offices. But when you consider that these particular slabs of baked enamel are the first registration plates ever made in Victoria, and that in the past they has been sold for $165,000, the security seems justified. Local legend has it that when the plates were made in 1932, three top Victorian, the Police Commissioner, the Premier and the Governor, argued for the honor to drive Vic 1. As is often the case with such touchy matters of protocol, no decision could be reached and the plates were locked in a vault at the Motor Registration Board. There they stayed until October, 1984, when they were bought for $165,000 by a retired Ballarat mechanic. The man kept the plates in his collection of about 20 historic number plates until last year when they were bought by I. Herzog and Associates, which owns City Saab, for an undisclosed sum, which usually means a lot. While previous owners had seen fit to keep the plates under lock and key, City Saab used them to help raise $22,000 for the Deafness Foundation in November. The plates were then returned to the care of the RTA, where they have been kept in a safe, swaddled in cloth. The plates are now up for grabs again and this time, to do something the Governor, the Police Commissioner and the Premier couldn’t, you can expect to part with about $250,000. If you have further information about the Vic 1 plate please let us know.